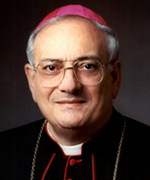 In the latest in a series of diocesan newspaper columns on the upcoming election, Bishop Nicholas DiMarzio of Brooklyn lamented the Obama-Biden campaign’s emphasis on abortion and contraception. It is inconceivable to me how Catholics could support such policies. Indeed, Roman Catholics who support abortion rights and vote for a candidate because of those policies, place him/herself outside of the life of the Church. In so doing, they also place themselves in moral danger. Is it possible to vote for somebody despite their support for these policies? To my mind, it stretches the imagination, especially when there is another option. The dignity and sanctity of human life are the foundational values upon which all other policies are built. Concern for the poor, the stranger in our midst, they are all predicated upon our belief in the dignity and sanctity of human life.